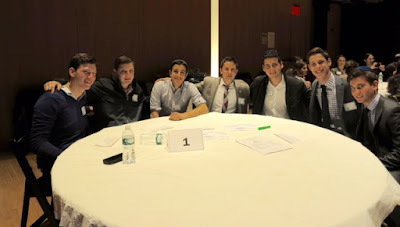 On June 3, 2015, Yeshivah of Flatbush students, Shlomo Husni and Morris Shalom, joined other high school students from the tri-state area for a text study event with Rabbi Ethan Tucker as part of Unity Day. Unity Day, which is sponsored by the UJA-Federation of New York is meant to foster unity among all Jews of the community. This particular event was set in memory of Naftali, Gilad, and Eyal, z"l, who were kidnapped by terrorists on their way home from school. Jews throughout the world came together to search, pray, and offer support. The families of the boys wanted to honor the memory of their children by continuing this legacy of unity.